This is a basic choux pastry recipe used for Crème Puffs, Profiteroles and Eclairs. Once you try it you will realize it is so much easier to make than it seems and you’ll be a pro in no time ! Keep this one in your arsenal for impressing the most intimidating of dinner guests. I doubled this recipe to make enough for extras, they keep well. Bring water, butter and salt to a boil. Add all of the flour at once and beat until mixture forms a ball. Remove from heat and beat for 2 minutes just to cool mixture off a bit. Add one egg at a time beating well after each addition. Beat until finish is nice and smooth and a bit shiny. Grease your baking pan or line it with parchment paper. keeping them about 2” apart. Bake 50 minutes or until golden brown. 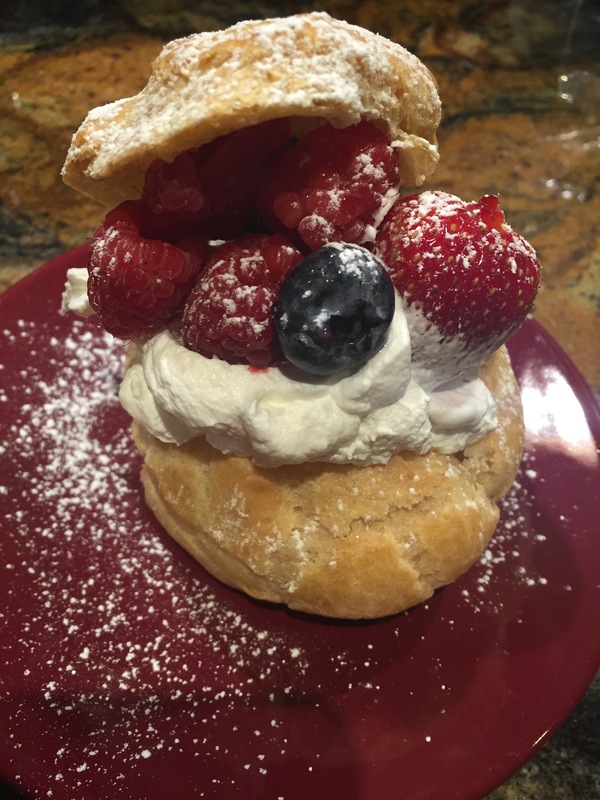 Remove from oven and pierce each cream puff with a knife to allow steam to escape. Before serving slice tops off . Clear any pastry that is still moist and in your way of making a well for filling. Fill with your favorite filling. This time I used whipped crème and fresh berries but you can easily make another delicious dessert and fill these with ice cream, top with hot chocolate sauce to make the perfect Profiteroles ! !